The index opened strong and after an initial dip saw huge buying interest to close strong near the highs of the day at 7683.30, gain of 70.80 points. The broader market was also strong, with 1117 advances to 418 declines. The range for series is back to 7500-8200. Call option 7700 added 4.49 lacs OI with profit booking seen at 7800 and above strike prices. 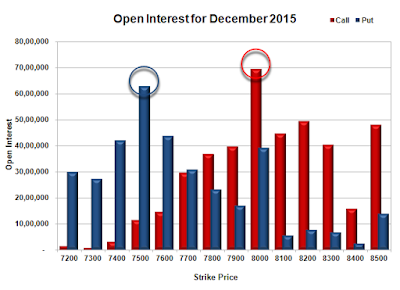 Put option 7600, 7400-7300 added huge 10.14 lacs OI with short covering seen at 7800 and above strike prices. Nifty Open Interest is at 1,88,65,800 down by 6,92,475, with increase in price, most probably huge short covering. Bank Nifty Open Interest is at 25,29,900 up by 1,78,200, with increase price, most probably huge long build-up. FII’s sold 0.52 lacs Futures, which includes net 1072 contracts long build-up and 3154 contracts short build-up, with increase in net OI by 4226 contracts, includes 24273 longs to 26355 shorts for the day. FII’s Index future open contract as on date is 123354 Longs to 146547 Shorts, Net (-)23193 down by 2082 contracts. 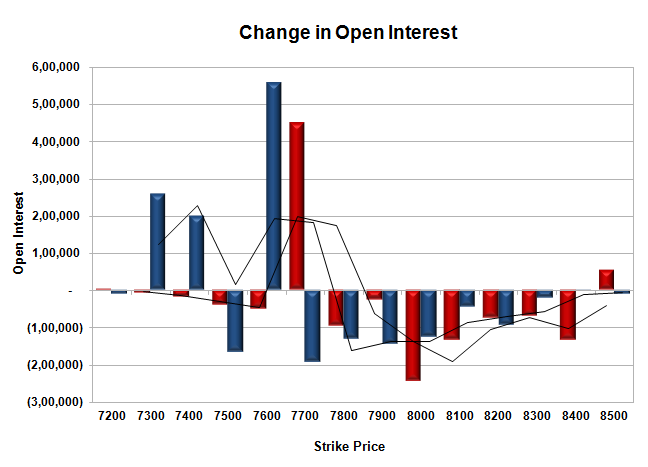 Initial super support at 7600, with OI of 43.81 lacs and below that at 7500 with OI of 62.81 lacs. 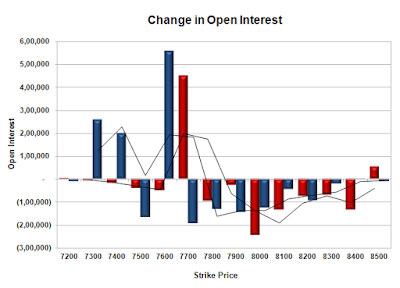 Initial resistance at 7800, with OI of 36.93 lacs and above that at 8000 with highest OI of 69.50 lacs. 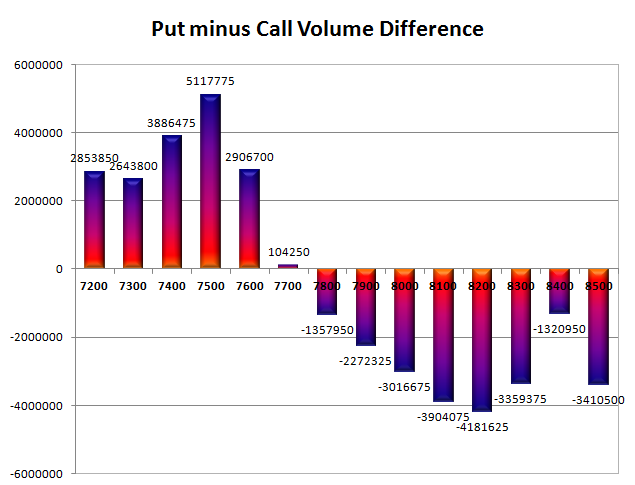 Day Range as per Option Table is 7609 - 7727 and as per VIX is 7616 - 7751 with 7662 as the Pivot.